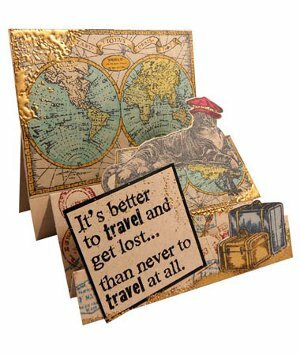 Wish a loved one bon voyage, happy birthday, or just send a friendly greeting with this To the Ends of the Earth card from Stampendous. This pop-up style card can be used for almost any occasion, and it's so easy to make and customize to suit your needs. This card is sure to impress anyone who's lucky enough to receive it. Score an 11" x 5" panel of Kraft Cardstock at 1", 2", 4", 6" & 8 1/2". Fold every other way on folds to create a stair step card base. Randomly stamp images from Air Travel stamp set with various Distress inks on card base. Stamp Map with black ink on a panel of Kraft card stock and color with markers. Trim Map along edges and adhere to the back step of the card. Stamp Catifur on Kraft cardstock with black ink and color with markers. Fussy cut out Catifur and adhere to second step. Stamp suitcase image with black ink on Kraft cardstock and color with markers. Fussy cut out suitcases and adhere to the right front step. Stamp senitment on a Kraft cardstock panel with VersaMark ink and heat emboss with detail black embossing powder. Back sentiment panel with a slightly larger black panel and adhere to front left of card. Sprinkle Aged Gold Embossing Enamel randomly on card and heat from underneath until melted.